Just because you’ve joined the throngs of tourists flocking to Cebu and shopped Makati in Metro Manila, don’t think you’ve experienced all the Philippines has to offer. With over 7,000 picturesque islands, there are plenty of undiscovered tropical paradises with beautiful beaches, clear blue sea, and coral reefs to explore. Of course, “undiscovered” doesn’t really mean that the island has never had human contact. In fact, most of the islands you might travel to have some form of resort on them. So, why call them “undiscovered”? Because these places are off the beaten tourist path – they’re not part of the mainstream. While they may have settlers and resorts, the vast majority of the land on these islands is left to nature. Just take a stroll away from your hotel or hut, and you’re likely to find a beach that you can have all to yourself. Which islands should you go to in order to get this slice of natural beauty? Well, that depends on what you’re looking for, because every place has unique aspects to them that might appeal to different people. Here are just a few of my favorite “undiscovered” islands for you to choose from. If you’re only feeling just a tiny bit adventurous, you might want to check out Boracay. Like Cebu, Manila, and other popular destinations in the Philippines, parts of it are pretty built up with nice resorts that offer plenty of activities. It’s also home to several beaches that always seem to rank highly in all those “world’s best beach” lists, and it’s a very popular party destination, offering plenty of restaurants, bars, and clubs for all your nightlife desires. For the island’s best paluto restaurant, check out Smoke. You can order Filipino food a la carte or – my favorite – bring your own ingredients and they will cook it for you! In the mood for a Swedish, Accupressure or Shiatsu massage? Most of the masseuses around don’t have that kind of training, but there is one – Abe (it pronounced Abby), a blind masseur that works in Angol outside of Cocoloco restaurant. With all of this, why is Boracay still considered undiscovered? Because most of it is still covered with huge mountains, hidden caves, wildlife, and tucked away beaches. I like to leave touristy White Beach behind and join the locals across the island at Puka Beach. Or watch kiteboarders do their thing on windy days at Bulabog Beach. And while snorkeling and scuba diving is nice, you can’t leave without hiring a guide to take you to the Bat Cave. It’s way off the beaten path, and climbing down into the mouth requires quite a bit of care to avoid slipping on the rocks and bat guano, but it’s a sight to behold. Even better, you can get two for the price of one by also checking out the nearby Crystal Cave and climbing up to look out over the sea. Just don’t be afraid to haggle with the guide a bit; most will quote you 2500P, but that’s considered the “tourist” rate. The largest province in the Philippines, Palawan is made up of almost 2,000 different islands. Some of the islands boast incredibly nice resorts, but many others are virtually untouched by human hands. For a very affordable rate, you can hire a boat to take you around to some of these islands so you can snorkel, cliff dive, rock climb, or hike in some of the most beautiful places in the world. Unfortunately, flying to Palawan can be a bit anxiety inducing. Not because you’ll have to travel in tiny propeller planes over shark-infested waters, but because before getting on one of these planes, everything you own – including you – will have to be weighed. In front of other people. Go over the weight limit and your bags will have to fly separately – or you might not be allowed to fly at all! If you do travel to Palawan, though, you have to check out two places. The first is El Nido, home to what has been called the best beach in the world, as well as some of the best fishing, bird watching, kayaking, lagoon tours, diving, and snorkeling I’ve ever experienced. The second must-visit attraction is the awesome Puerto Princesa Subterranean River National Park, which is home to the world’s longest underground river. Words can’t describe what it’s like to take a boat tour through this amazingly unique place, which was recently chosen as one of the New7Wonders of Nature. If you’re the type of person who likes heat and adventure and you’re tired of all the resorts, Camiguin is just the place for you. It is called “The Island Born of Fire,” and though it’s small in size, it is home to many volcanoes you can hike and explore, as well as a number of gorgeous waterfalls. One of the best – Katibawasan Falls – lies just on the outbound range of Mt. 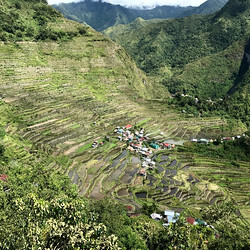 Hibok-Hibok, and once you see it you won’t want to leave. Are you more into relaxation? That works too, because few things melt your worries away better than Camiguin’s soothing hot springs, and the pristine white beaches are perfect for lying out in the sun without worry of being disturbed by obnoxious tourists. Just as easygoing and relaxing is the food, with plenty of simple but bountiful dishes that feel like home-cooked meals. Try the extremely rare tabon-tabon fruit with tuna, or a local dessert delicacy called a kiping – sheets of fried rice topped with coconut syrup. Aileen Pablo is a freelance blogger and sports enthusiast. She currently writes for https://eccobike.ca/. Their mission is clear, forget the car and get around with zero CO2 emissions on thousands of trails and roads across North America. When not working, she likes to travel around the Philippines and enjoys blogging about it. I have heard of Boracay, but not the others. Which ones would you recommend for experiencing the local culture? Hi Michelle, I’m from the Philippines and I would suggest Camiguin or Bohol island if you want to experience local culture as well as enjoying nature. In both islands, you have gorgeous beaches, rivers and waterfalls. Palawan is also a great destination, although I don’t have first hand experience. Boracay is veering towards becoming a destination with first world amenities, so local culture may not be as authentic as you would want it to be. Oh my gosh, I LOVE that first picture. The clouds and shades of blue are so pretty! I reallly hope to make it to the Philippines someday. Every week you see a new line enter an already overburdened designer fashion clothing market. Some of these new lines will go on to become the industry leaders while others, will simply become stepping stones for the others. wow, so for you Boracay and Palawan are undiscovered Island?